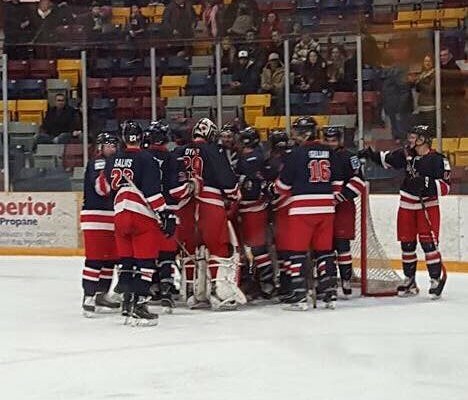 The Corner Brook Royals come up big to win game 3 of the Central West Senior Hockey League finals by a score of 5-2 over the Grand Falls-Windsor Cataracts on Saturday night at the Hodder Memorial Stadium in Deer Lake. Due to a scheduling conflict involving the Special Olympics, the Corner Brook Royals were force to play their home opener of the finals in Deer Lake. Team captain for the Royals, Michael Hynes opened the scoring at the 12:54 mark of the first period. Scott Doody shot the puck towards the Cataracts net and forced the Cataracts goalie AJ Whiffen to make a nice safe. Unable to contain the rebound, the puck sat on the ice allowing the Royals Jordan Kennedy to have a whack at the puck but it was captain Hynes who popped it over the goalie to make it 1-0. It was the captain’s brother Brandon Hynes who scored at the 15:41 mark on the power play to give the Royals a 2-0 lead, despite what was largely an ineffective power play by the Royals. Early in the second period, the Cataracts pulled within a goal when Danny Wicks scored after Andre Gill stripped the puck from the Royals defender, Justin Pender. Wicks took the feed from Gill and made it a 2-1 game. Cam Fergus was awarded an assist on the play as well. The Royals restored their 2-goal lead when Brandon Hynes scored again on the power play, making it 3-1 Royals. The Royals Mark Robinson made it 4-1 scoring the Royals third power play goal at the 18:41 marker with the Hynes brothers assisting. Grand Falls-Windsor closed the gap to just 2-goals when they pulled AJ Whiffen for the extra attacker. Nicklas Lindstrom scored at the 18:20 mark making it 4-2 Royals. Michael Hynes for the Royals scored an empty net goal to make it 5-2 Royals. Royals goaltender Bryan Gillis face 38 shots while the Cataracts Whiffen faced 28 shots. The Cataracts outshot the Royals 18-5 in the third period. Play resumes on Sunday at 2:00 pm as the Royals return home to the Corner Brook Civic Centre for game 4.